What are visitors doing on your registration page? Form Analytics provides you with conversion-critical information on the performance of your site's forms. Track a variety of form metrics. Understand your forms like never before. The Conversion Report lets you gauge how effective your form is at converting inbound visitors. The funnel gives you a quick overview of how many visitors make it through each stage of the conversion process. 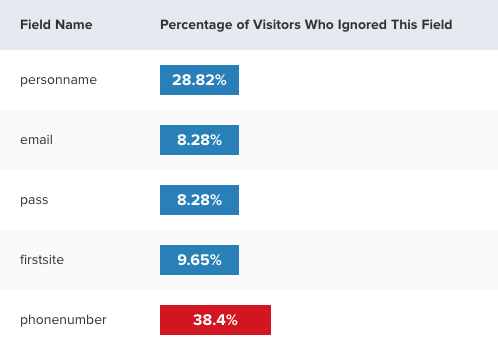 Identify where on the form visitors are hesitating the most. 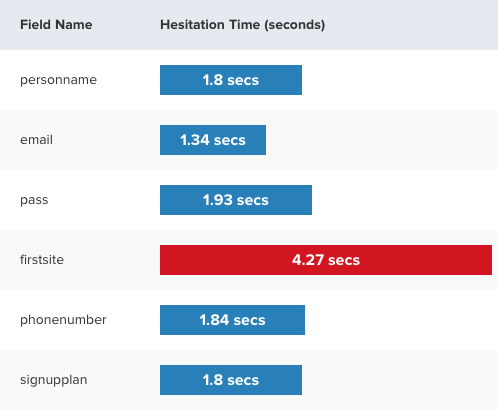 Inspectlet's Hesitation Report shows how much time on average visitors are hesitating on each input field. This includes time spent thinking about what to write in the field, understand what the field is, and anything else that can cause the visitor to hesitate. Our hesitation algorithm tracks a variety of signals that help decide whether a user is engaged or hesitating. The information this report provides is difficult to find in other analytical sources making this report very valuable. See which input fields are being refilled the most due to confusion and errors. The Fill Report tells you how often people are filling out that input field. This report can indicate issues with an input field such as: confusion about the meaning of an input, form validation errors occuring often, visitors not encouraged to fill out the whole form, or visitors not wanting to provide the information asked for. 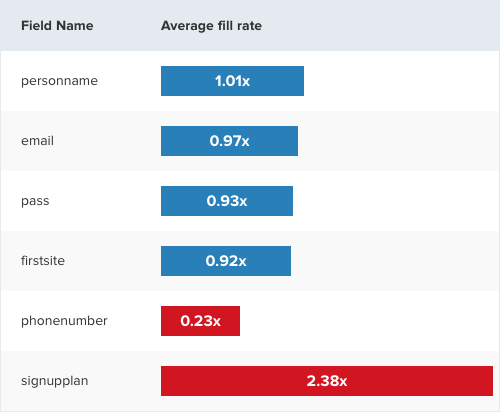 In the example pictured here, the Fill report is showing that people are changing their subscription plan a couple times before submitting the form, and only 23% of visitors fill out the phone number field. Find out which input fields are causing visitors to abandon the form. The Ignored Field Report tells you how often the fields in your form are not engaged with. This means that the visitor made no attempt to fill it out. In the example here, 38% of people are not engaging with the phone number field.